Mabel Irene Arbour (nee Woods) passed away on Friday, March 18, 2016 at Forest View Place, Clearwater, BC. She was 101 years of age. Born in McBride BC on November 14, 1914, she is survived by her son Ted (Sharon), Campbell River; daughter Pearl (Darryl) McRae, Clearwater; grandchildren – Sean (Deanna) Arbour; Jason (Dori) Arbour; Jamie Arbour – all from Campbell River, Jason (Vicky) Simons, Quesnel; Marshall (Samantha) McRae, Clearwater; Becky (Daniel) Bogner, Busselton, WA, Australia, and 8 great-grandchildren. Mabel was predeceased by her husband Moe in 1993, and by her mother, Pearl Woods in 1988. Mabel was a daughter, wife, mother, caregiver and volunteer. This is what her children had to say about Mabel: There are so many wonderful memories of Mom. She was part of one of the pioneering families in McBride and so learned about hard work as a young child. She carried this work ethic with her through her entire life. With strength and courage she survived breast cancer and went on to live for 32 more years. Mom loved to bake; she was known to get up early in order to have a fresh hot batch of biscuits ready to follow the daily porridge she made for the family breakfast. She also was famous for her bread and Icelandic Cake. She loved her coffee hot and sweet as well as the occasional drink of rye and ginger-ale — no ice. Mom was a prolific knitter. She knitted numerous sweaters and afghans and was famous for her knitted dishcloths which have been sent to many places around the world. Mom loved her grandchildren and enjoyed doing things with them. From taking them to the Pumpkin Patch in Vernon to overcoming her fears of water and boats in order to go whale-watching, spending time with her grandchildren and great-grandchildren brought her a great deal of joy. Mom was game for anything, even in her later years. She loved to travel and hike. Once she wasn’t able to hike any more, she used the stairs to keep herself fit. She loved to take tours with Saddle Rose Tours to explore places she hadn’t been before. In the past few years when she wasn’t able to do that anymore, she just wanted to get in the car when someone was going somewhere, even if it was just to the grocery store. Mom was such a character. Anyone who knew her knew that if she managed to get behind you, she was bound to pinch your bum! 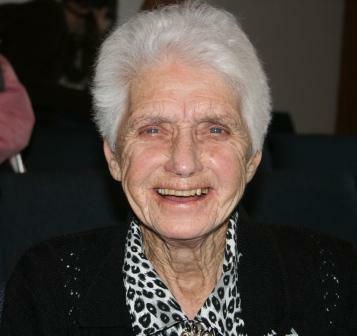 She also loved to play cards and was hard to beat at cribbage, even in her last few years. Mom will be fondly remembered by anyone who was lucky enough to have met her. Rest In Peace Mom. The family wishes to thank all the staff and Doctors at Dr. Helmcken Hospital for taking care of Mabel. A graveside burial service for Mabel will take place on Tuesday March 29 10:00 a.m. at Pleasant Valley Cemetery, Vernon, BC. Reception to follow at Schubert Center. In lieu of flowers contribution to Forest View Place – Recreation Program; Breast Cancer Society of Canada, or charity of your choosing. On behalf of the Jeck family, who’s ranks have thinned over the years, my wife Ev and I would like to express our deepest condolences to Pearl and Ted and their families, and to all others who fondly remember Mabel (Woods) Arbour. It was a great pleasure to spend a few moments with Mabel at her 100th and 101st birthday celebrations. We were able to renew early memories of times growing up in McBride where we both were born. A wonderful, bright and cheery lady to the end. What great memories of you and parents, Ted. Always a joy to tie up my horse at the gate (winter) or wheel in my bike (summer) and trundle up to your beautiful home to deliver the Toronto Star Weekly to your mother Mabel, and family there. Teddie, I will never forget seeing you excel in the boxing classes, for phys ed in High School (teacher Bill Simmons). Great to see your names, from the email sent by Ray, May your Mum’s rewards be great…what a long and blessed life she had.